TIFFIN — The price tag for a new Seneca County Courthouse is on the rise, surpassing the cost estimates of renovating the former courthouse as advocated in 2011 by preservationists, who argued at the time that restoring the historic courthouse was cheaper than demolition and new construction. Tiffin and county officials learned recently that the projected cost of a new city/ounty courthouse could be $11 million, up from the $10 million target price, and a March, 2014, estimate of $8.5 million. What seems clear now is that renovation of the courthouse, if undertaken in 2011, would have been cheaper than the now planned new construction. 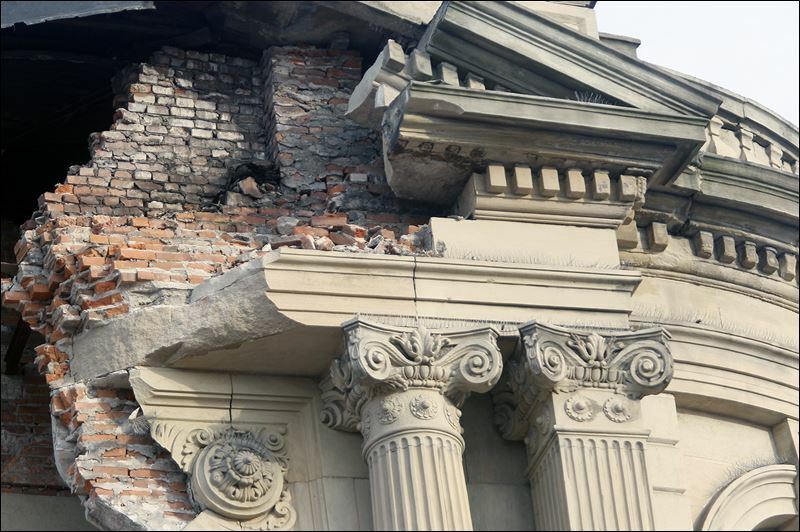 That undercuts arguments at the time that the need for a new building was because of economic necessity. “To scream and holler for $8 million, now it’s OK for $11 million?” Tiffin resident and preservationist Karin Brown said. Officials estimated in 2011 that the cost to renovate the Beaux Arts-style courthouse would have been about $8 million. Pitching in to cover that would have been $1.65 million in donations pledged by preservationists, $500,000 from the Ohio Department of Development, $500,000 from the Seneca County Common Pleas Court, and a $5 million low-interest loan from the U.S. Department of Agriculture. The county would also chip in $350,000. The Seneca County Courthouse’s exterior columns were ornate and detailed — as was the rest of the structure. Franklin Conaway, head of the Seneca County Courthouse and Downtown Redevelopment Group, said his group’s estimate in 2011 was that a new courthouse, including the cost to demolish the old one, would carry a $15 million price tag. Former Commissioner Dave Sauber, who opposed in 2011 the plan to demolish the courthouse, said the decision was one of the biggest mistakes ever made by the commissioners. Mr. Sauber had advocated that the building be mothballed by a private group, because the county couldn’t afford demolition. “It is a shame, and I think people really, really regret their decisions now,” Mr. Sauber said. Mr. Sauber wasn’t always a courthouse backer. In 2006 he and former commissioners Ben Nutter and Joe Schock voted to demolish the courthouse. 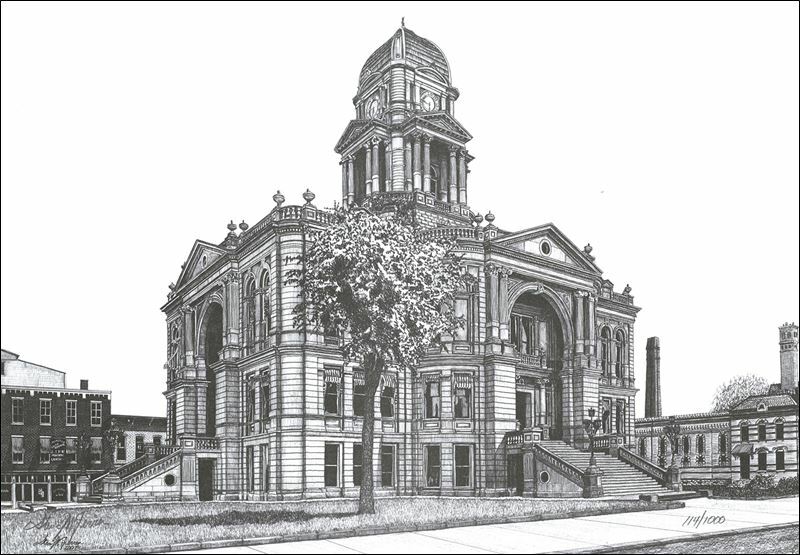 Preservationists tried to sway the commissioners toward restoring the courthouse, designed by renowned 19th century architect Elijah E. Myers, by bringing to Tiffin the head of the Texas Historic County Courthouse Preservation Program, Stan Graves. Despite laudatory comments by Mr. Graves about the courthouse — he declared its craftsmanship better than the Myers-designed Texas statehouse — Mr. Sauber said at the time that the decision to tear down the courthouse had already been made. That testimony, and many other pleas by preservationists and experts, had little effect on the commissioners at the time. Former Commissioner Dave Sauber, who opposed in 2011 the plan to demolish the courthouse, said the decision was one of the biggest mistakes ever made by the commissioners. 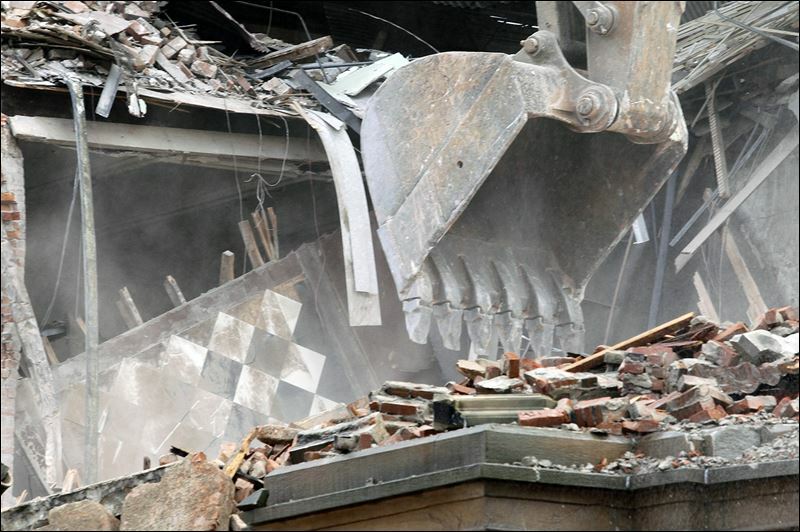 The demolition cost approximately $375,000. Mr. Nutter has not changed his view on his vote to destroy the historic courthouse, which graced Tiffin’s downtown for 128 years. He told The Blade recently that he stood by his decision, saying in 2010 and 2011 there was a dispute over whether the cost estimates to renovate the old courthouse were accurate. The building wasn’t properly mothballed — “It was abandoned,” he said — increasing the price of renovation and making new construction a better deal for taxpayers. He claimed that was the fault of commissioners before his time. The current scope is different. While the historic courthouse was 33,000 square feet, the proposed new structure would be about 36,000 square feet. The joint Tiffin and county project would devote 75 percent of the space to Seneca County, along with 75 percent of the cost, with the city moving its Tiffin-Fostoria Municipal Court to the joint center. 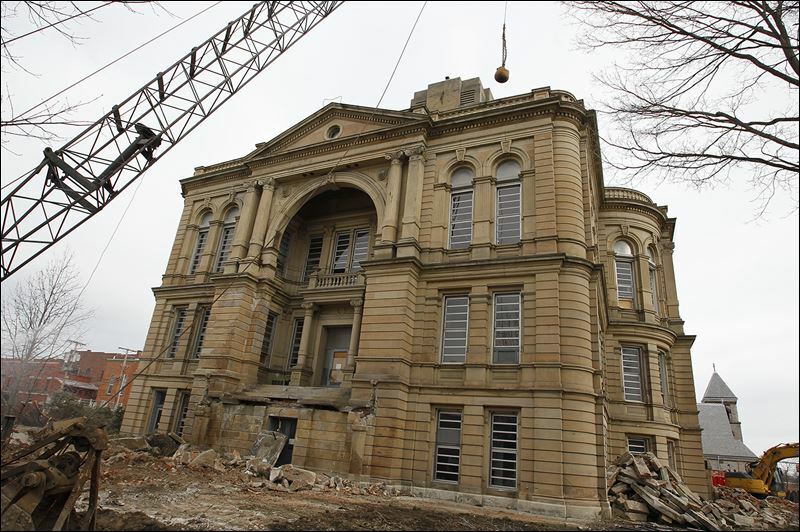 Under those estimates, the county would have 6,000 square feet less in the new courthouse than the demolished historic building, with a current cost sharing of about $7.25 million, though that doesn’t include the approximately $375,000 to demolish the old courthouse, and doesn’t include the $1.6 million Tiffin preservationists pledged if the commissioners would have agreed to restore the former historic courthouse. It is clear, they say, that when all the financing options are considered, the current board of county commissioners is now faced with spending significantly more taxpayer money to build a new courthouse because past commissioners were too shortsighted and bent on destroying the former courthouse. Mr. Conaway said Mr. Nutter is wrong to say there were problems with restoration estimates and the preservationists’ financing plans. The architect said the renovation plans were detailed because preservationists knew they had to provide sufficient information if they were to persuade the commissioners and the public. The firm that created the renovation design, Schooley Caldwell Associates, has successfully worked on several large renovation projects — including the Ohio Statehouse, the Utah State Capitol, the Columbus Museum of Art, and the Old Montgomery County Courthouse in Dayton. Preservationists also had independent contractors prepare estimates to confirm the projected costs of renovation. Local and state preservationists were so adamant about the need to preserve Seneca County’s courthouse because of its quality, craftsmanship, and the man who designed it — Elijah Myers, who in the 1880s was one of the pre-eminent architects of public buildings in the country, building not only the Texas but also the Michigan and Colorado state capitol buildings, which still stand. Preservationists from around the country marveled at the quality of the courthouse. “This building is literally irreplaceable,” said Kerry Chartkoff, historian of the Michigan Capitol, in 2007 after inspecting the building. “They have a fortune in materials that are no longer available anywhere. 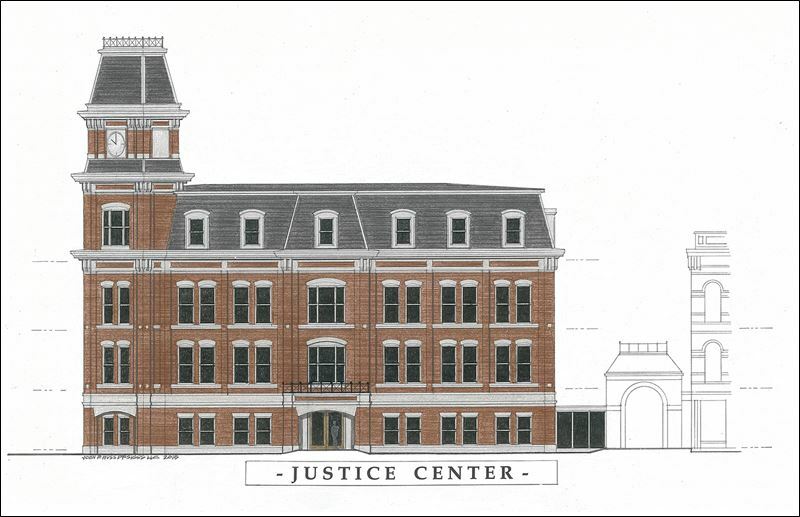 A conceptual plan shows the joint justice center that will be shared by Tiffin and Seneca County. The proposed structure would be about 36,000 square feet. It turns out that Elijah Myers used the best materials available for the Michigan Capitol and the Seneca County Courthouse — the same black carbonized limestone and beautiful white Vermont marble was used for the black and white tiles in the floors throughout both buildings. The Vermont General Assembly has passed a law that none of the scarce remaining white marble may be quarried out of the last quarry in the state where it is found. Valerie Marvin, who also works at the Michigan Capitol, visited Tiffin to inspect and photograph the courthouse for the Elijah Myers archives that Michigan maintains. “You can see the original woodwork. Much of it has never been painted. The quality is better than what we have at the Michigan Capitol,” she said. “The original glass transoms are still there with the original department names painted on them. “The staircases are all original cast iron and there are two or three large vaults to store records, with original doors and circular cast-iron staircases in them,” Ms. Marvin said. But for her, finding the black limestone and white marble tiles was a moment she’ll always remember. Elijah E. Myers, who designed the Seneca County Courthouse, used black carbonized limestone and beautiful white Vermont marble for the black and white tiles in the floors throughout the Beaux Arts-style courthouse. None of such glowing expert testimony moved Mr. Nutter and Mr. Wagner, however, who besides voting to have the courthouse demolished also refused to allow preservationists or archivists from Michigan’s capitol to salvage material from the structure. Karin Brown, the Tiffin preservationist who was on the city’s Historic Trust board, said that preservationists tried for years to convince commissioners of the importance of renovation and on the economic benefit, to no avail. “We fought for years and years and years, and there was absolutely no way that you could make them understand what the courthouse could have brought to the county,” she said. Staff writer Jim Provance contributed to this report. Contact Nolan Rosenkrans at: nrosenkrans@theblade.com or 419-724-6086, or on Twitter @NolanRosenkrans.